The view along the South Platte River in the Pike National Forest, in 1903 and 2012. When wildfires burn in dense forests today they are often hotter and can destroy more trees. This is part of an 85-acre area of Hall Ranch that's been thinned and restored to be more like Colorado forests a century ago. 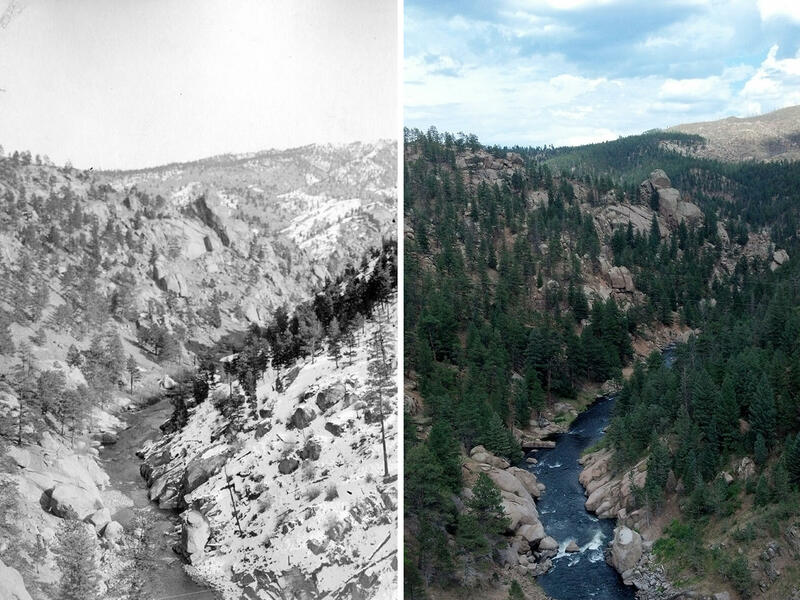 This photo pairing shows Colorado's Geer Canyon in 1911 and 2006. Decades of efforts to suppress fires have helped increased the density and homogeneity of ponderosa pine tree forests. 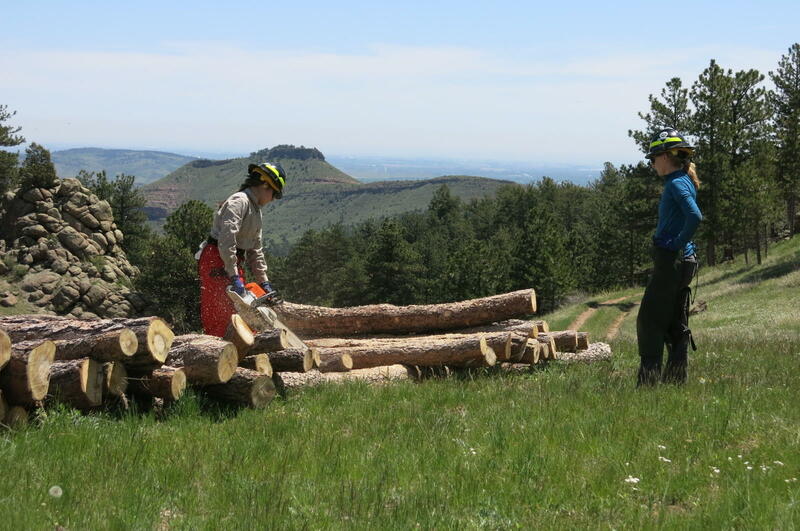 Boulder County Parks and Open Space cuts trees to thin forests, an effort to prevent wildfires from speading. Some of the trees are sold for firewood. A key focus is the blanket of post-card perfect evergreen forests the state is known for, but whose lower elevations have become far more crowded than they were a century ago. "The first thing I see is we're missing the meadows. Where are the meadows?" asks Tony Cheng, director of the Colorado Forest Restoration Institute at Colorado State University. 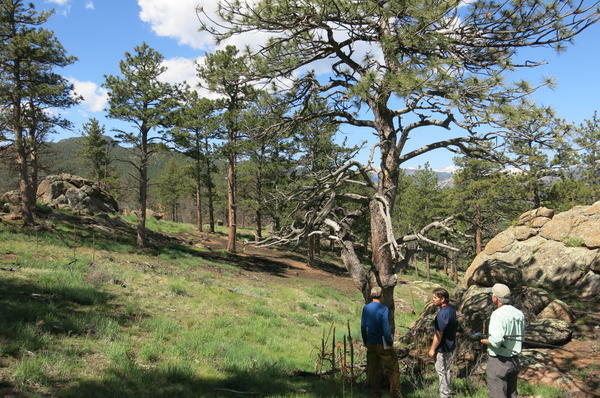 Cheng, along with Peter Brown of the Rocky Mountain Tree-Ring Research organization, researched the history of forests at Hall Ranch, a 4,000 acre recreation area in Boulder County. On one plot he shows me, a carpet of pointy green trees crowds out the light. Brown says there are "ten times as many trees in these stands as there were historically." 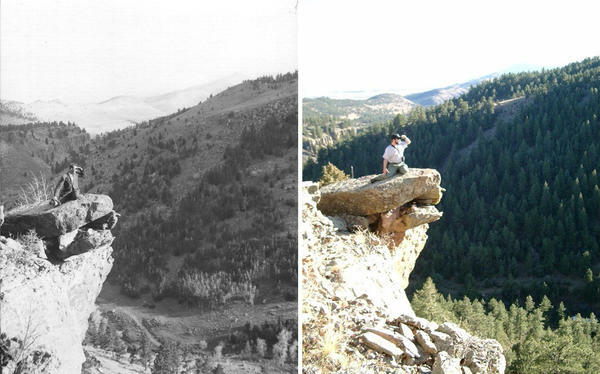 Euro-American settlement in the 1860's dramatically changed Colorado's forests. Before then, large open meadows separated small stands of ponderosa pines. Low intensity wildfires would have moved through those stands regularly. Today, generations of livestock grazing and mining have reshaped forests, as has the creation of an agency devoted to curbing wildfires. In Colorado, some forests haven't seen fire in more than a century. They are more dense, and thick with undergrowth. That means when fires do happen, there's more fuel for them to burn hotter, and they can spread faster from treetop to treetop. Now, Cheng and Brown's research, published in April in Forest Ecology and Management, offers specific guidelines to help restore and manage Colorado's forests in a way they say is more friendly to wildfire. Similar research has been done in Oregon and New Mexico. "We're not trying to exclude fire," Cheng says. "We're actually trying to set the landscape up to receive fire." The idea may be counterintuitive, but regular, small fires can help prevent larger ones that are hotter and more destructive. Another key seems to be more diversity in tree type and age. "There were a variety of tree sizes," says Mike Battaglia, a U.S. Forest Service researcher and lead author of the Colorado study. "Some stands were pure ponderosa pine, and others were mixed with Douglas fir." 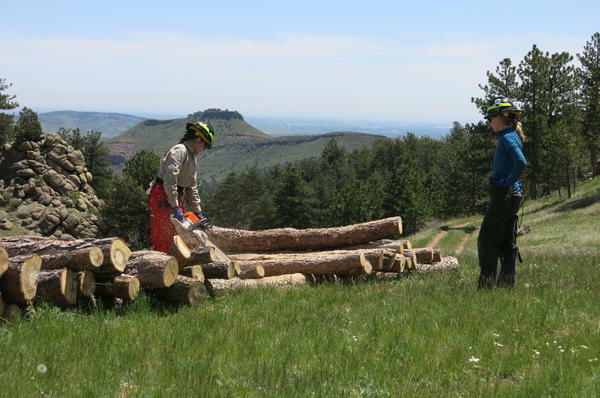 Guided by this historical research, seasonal workers in Boulder County, Colorado, are already at work thinning forests. At Hall Ranch, more than a thousand tree logs are stacked chest high in a large, open meadow. The county will sell this firewood to the public. The end result looks like what you might have seen here a century ago. Groups of old and young trees appear in clumps. There are large open spaces, and a giant meadow. If you look closely at the ground you can see charred earth from a previously introduced fire. "There should be pocket openings, there should be a couple of dense areas, there should be areas with five or six very large trees sitting together," says Stefan Reinold, Boulder County's senior forestry resource specialist. As part of the overall strategy, Reinold set this 85-acre patch of land on fire few years ago. The controlled burn happened after hundreds of trees had been cleared. Today, some trunks are charred black as ink. A few trees did not survive the fire. Others look completely normal. The fire was an effective way to clear the underbrush and ponderosa pine needles and cones that litter the ground, and which can act as fuel to spread fires. But this work doesn't come cheap. Reinold estimates it takes about $4,000 an acre to re-create meadows and a more diverse mix of trees. By that metric, the cost of this 85-acre project is about $350,000. "You can get that price down through different treatment options," Reinold says, but there are trade offs. If you use a wood chipper to process logs where they're cut down that material then litters the forest floor. The chips can smolder and trap heat, and make management of future fires more difficult. Colorado has a long way to go to truly get back to historical forest conditions. According to a Front Range collaboration among federal, state and local forest agencies, only about 300,000 acres of a 1.5 million acre area have been treated with fire or forest thinning so far. With predictions of a severe wildfire season this summer, that leaves a lot of densely forested areas to worry about. Copyright 2018 CPR News. To see more, visit CPR News.